This week’s RemembeRED prompt: As the school year is wrapping up and we're on the cusp of summer, we've decided to go easy on you. In the three decades since I sat in that class, many other terrific memories have stayed with me. 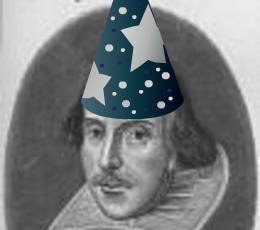 The best, by far, is that of our celebration of the Bard’s birthday, which we marked in 1980 on Wednesday, April 23, the accepted date for his birth, which actually is unknown. Complete with hats--the pointy ones with under-the-chin rubber bands to hold them in place--our celebration also included a thickly frosted birthday cake adorned with sugary roses and inscribed “Happy Birthday, Will” and our choice of a red (grape juice) or white (milk) beverage. We rounded out the festivities with a hearty toast to Will and individualized recitations of our memorized passage--each one a personal tribute to the guest of honor. Nearly a decade after that 1980 birthday party, I mailed a postcard from Shakespeare’s home in Stratford-upon-Avon to Mr. Job back at the high school. It was, I believe, my own personal tribute to the man who not only brought Shakespeare to life, but who also nurtured in me a love of literature that I carry with me to this day.